The discovery of soft-tissue comb remnants on a fossil could change the way we visualise dinosaurs. 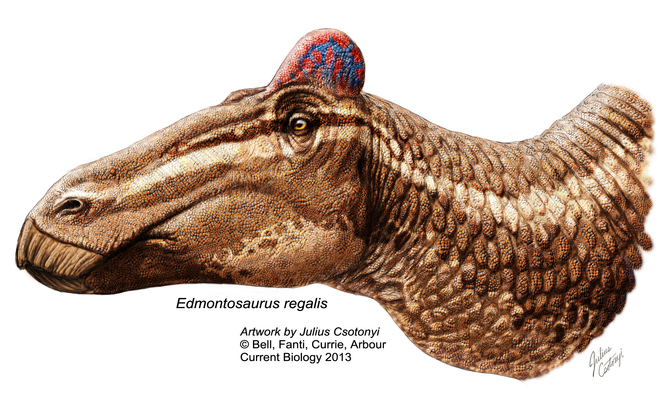 The findings, published today in Current Biology, concern the fossilised remains of an Edmontosaurus regalis skeleton excavated in Alberta, Canada. What makes this specimen notable is the presence of a cranial crest composed entirely of soft tissue — somewhat comparable to a rooster’s comb. via Think you know what a dinosaur looks like? Think again …. One of the freakiest things in recent years has been relearning the appearance of dinosaurs. When I was a boy, dinosaurs were these large lizard like things but, although movies and popular culture are taking a while to catch up, scientifically it seems like they’re now looking more and more like Big Bird. As I’ve commented before, we have to be careful about our assumptions. This entry was posted in Zeitgeist and tagged Alberta, Big Bird, Current Biology, Dinosaur, Edmontosaurus, Fossil, Hadrosaurid, University of New England. Bookmark the permalink. Yes, assumptions never did fit in the scientific model of inquiry. Some of the reason for widespread misunderstanding on this goes to scientists that express their opinions along with their science to their public. In science, they are careful to publish the empirical evidence and in public to smile and state their speculations as though these too are fact. There are the imaginers, dreamers and amateur philosophers too. There is the media looking to print a sensational scoop. Its difficult then for folks that want to find out what is what for real. So, we do the best we can. I agree. When it comes to credibility of scientists, I find it helps to pay attention to how others in the field regard them or their ideas. It’s a red flag for me when someone claims that the rest of their field is incompetent or in conspiracy. Not only does this change our image of dinosaurs, but potentially their existential status. The claim that birds are dinosaurs may be taken more seriously by some, by seeing that dinosaurs might have actually looked like birds. It also puts the Terror Bird in perspective. In fact, a while ago, I blogged on whether we can actually push back the end of “the age of the dinosaurs” to 2 million years ago (or less) based on the Terror Bird. That’s interesting about the Terror Bird. I hadn’t heard of them. Thanks!